Assam Chief Minister Sarbananda Sonowal on Saturday announced introduction of two awards to promote creative writing worth Rs 10 lakh and Rs 5 lakh. The Chief Minister announced this while inaugurating the third edition of Brahmaputra Literary Festival. While the national level award to be presented during the next edition of the festival will carry a reward of Rs 10 lakh, the state level award will offer a reward of Rs 5 lakh. “The festival would inspire youth of the state in the realm of creative writing and help them to evolve as good human being. All writers are committed to human welfare, whatever thoughts they pen down; it touches human conscience and contributes to development of society. 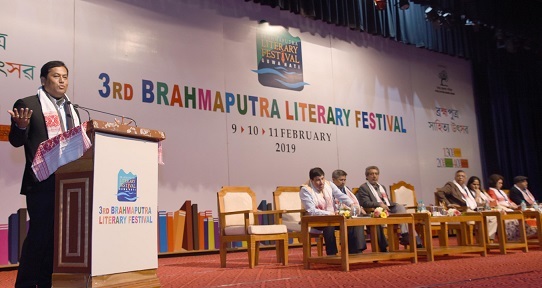 This festival is a big opportunity for the youth of our state and interaction with the acclaimed writers will not only broaden their horizon but would also lead them towards a meaningful life,” the Chief Minister said. The current edition of this Literary Festival organized independently by Publication Board of Assam under the guidance of State Education Department has put special focus on ASEAN literature. Celebrity authors from 10 ASEAN countries as well as writers from United States, United Kingdom, Australia, Sri Lanka, Tibet and other countries have participated in this festival. Sonowal also hoped that association of the young writers with the creative genius and intelligence of these acclaimed writers would immensely help them and prove to be a stepping stone for success in life. He also appreciated the organizers for planning interaction sessions of aspiring writers with the participating authors, which he said would be a great learning lesson for the young writers. Stating that the best contribution to mankind is the service to society, he expressed the view that the festival would give an impetus to state government’s initiatives to promote people to people contact, cultural and literary ties as well as commercial relations with the ASEAN countries. Dr Ma Thida, eminent author from Myanmar and guest of honour on the occasion in her speech, impressed upon the importance of freedom of imagination, speech and opinion. She said literature doesn’t have any race and the freedom it requires for promoting better human society must be respected.